Alabama (-265): The Tide are understandably the heavy favorites to win it all. 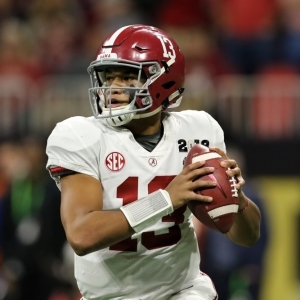 Tua Tagovailoa has shown no signs that he is at all mortal, and the offense is incredibly strong. Critics, looking to hold on to any hope, will point at a couple of things, though. First, they have played a soft schedule. Beyond an obviously overrated LSU team, their best win is against probably Texas A&M. They are beating up on weaklings. In the playoffs they could play a very seasoned Clemson team, or an incredible Michigan defense - both steps up from what they have seen so far. And while their offense has been unstoppable, their defense is a long way from their best. Sure, they shut out LSU, but if you look at Joe Burrow and see a good QB in charge of a good offense then you and I watch this sport very differently. Still, Alabama is a very deserving favorite. Probably not as much of a favorite as this price suggests with three games and a conference championship to play before two playoff games, but still deserving. Clemson (+450): If you aren't impressed with the Alabama schedule then you really won't be impressed by Clemson's. Texas A&M is their best opponent so far - with apologies to N.C. State - and Boston College this week is probably the toughest game on their slate. They will win the ACC by default and will be a playoff lock unless they slip up against the Eagles on Saturday. And they won't. They are the only team with a Top 10 offense and a Top 10 defense nationally, and QB Trevor Lawrence is fast becoming a freak. Are they as good as Alabama? Probably not. But the difference in prices is too big, so there is at least relative value here. Notre Dame (+650): QB Ian Book is out for at least this weekend's Florida State game. If you have ever watched Brandon Wimbush play QB, then you know how much of a problem that is. Again, their schedule hasn't been great. They beat a Michigan team that was MIA that week and has been a whole new team since. They beat a hugely-overrated Stanford team and a troubled Virginia Tech one. And that's it. They have some somewhat tricky games left - Florida State, Syracuse and at USC. And they don't have the luxury of a championship game to pad their record. If they go undefeated they are in for sure. But if they lose one of these last three, I just don't see how they hold off a one-loss conference champion from the Big Ten, Big 12, or perhaps even the Pac-12. Michigan (+650): It's very simple for Michigan right now. Beat Ohio State in Columbus and they are going to the playoff. They aren't going to lose to Rutgers or Indiana, and their division consistently has massive advantages in the championship game. The Buckeyes have some issues right now, and the Wolverines are playing with massive swagger. I'll flat out say it - they are a playoff team - and one that I wouldn't want to play. Georgia (+1800): I just don't see their path. This is a team that lost to LSU, and to get to the playoff they have to beat Alabama. I don't see it happening. This is not the same team we saw last year, and they just aren't as scary on either side of the ball. A nice team - a tough two-loss team that will be an ugly matchup in a New Year's bowl. But not a playoff team. And not at winner even if they did find a way in. Ohio State (+2000): The Buckeyes are still very much alive. If they beat Michigan and win the Big Ten, they will be right in the conversation, and their reputation will help them. But things are not right with this team. Besides getting crushed by Purdue, they have played too many teams close. Their defense is a mess, and their offense is not nearly as dangerous as it has been - especially on the ground. This is a team without mojo. I suspect that things will work themselves out and we won't have to worry about how to deal with this team after the Michigan game. Oklahoma (+2200): The Sooners are very interesting. Their loss to Texas by a field goal doesn't look terrible, but they have yet to beat a ranked team. And their first chance will come in a brutal challenge at West Virginia. And then they will likely play West Virginia again in the Championship Game. To beat that team twice is a lot to ask - a split feels more likely. But if Oklahoma does do it, they would be in a decent spot. It doesn't feel like they determine their own fate, though. They aren't going to knock an unbeaten team out, and the two West Virginia wins alone aren't enough to get them past a 12-1 Michigan. Or perhaps not even a 12-1 Ohio State. They need a lot of help. A Notre Dame loss is their best hope -- and the more lopsided the better. West Virginia (+10000): The Mountaineers' loss to Iowa State is worse than Oklahoma's, so that's a small problem. But just like the Sooners, the Mountaineers can put themselves in good shape by winning their next two and then beating Oklahoma twice. I don't particularly believe in the coaching of this team, and their reputation would likely make it harder for them than Oklahoma if they had the same record, but at least in relative terms there is more value here than in Oklahoma. Washington State (+15000): Gardner Minshew and the Cougars are a great story - overcoming tragedy with a massively one-dimensional offense to dominate a conference. But that conference is truly awful this year, and that will only hurt them. They lost to USC, and that looks bad. Beating Washington in the Apple Cup to close the year will mean nothing at this point. The conference championship game will be unwatchable. To get in this team would need a huge amount of help - probably two losses from Alabama or Clemson, a collapse in the Big Ten and/or the Big 12, a loss or two by Notre Dame, and so on. It's just not happening. Central Florida (+15000): This also isn't happening. Their winning streak is incredible, and running the table two years in a row should be impossible. But the rest of the schedules on this list look like murderer's rows compared to this one. To say they have played no one is a massive understatement. It is an incredibly weak schedule, and their defense still hasn't looked good at times. There is a path to the playoff for them, I guess - but the path for the Cougars looks like a six-lane highway next to this.